He torpedoed me, Chief. Nine months aboard the S-33 doing the best job I know how. A German U-Boat, designated U-571, torpedoes and sinks a freighter. Seconds later, however, the sonar man reports to have detected high speed screws. The captain turns the periscope to sight a British destroyer moving in, forcing U-571 to dive. The destroyer drops depth charges; unfortunately for the submarine, the depth charging caused a fuel leak near the engine crew is now working which ignites, setting them all ablaze. Due to the amount of damage sustained, the captain orders U-571 to resurface. The captain learns from his chief that they have lost a great amount of power, their starboard diesel engine is inoperable, and all of their mechanics are dead. After passing word to conserve electricity, he has his radioman send an SOS. to Berlin for aid. Meanwhile, the officers of the US Navy are celebrating the wedding of Larson. During the party, Lt. Tyler enters looking solemn because he didn't get his own submarine command. After complaining to Captain Dahlgren, he's rebuffed and upset. Suddenly military police officers come in saying their shore leave's over. All the men go to the submarine docks to find their boat, the S-33, being converted into the appearance of a U-Boat. Tyler rounds up Radioman Wentz who can speak German as well as English, a Marine named Coonan, and another Navy sailor named Hirsch who is also fluent in German. The boat goes off to sea and Hirsch explains to everyone what the mission is. The Allied radio direction finders detected signals from the disabled U-571. They are going to masquerade as the resupply ship U-571 called for. Coonan says that the Enigma is on board and that he will lead a boarding party to capture the U-Boat and liberate the Enigma. They'll then scuttle the boat so the real resupply sub will think that it was too late and the U-571 sank. Tyler is skeptical about the scheme working but goes along. Back on U-571, the repairs are not going smoothly and the captain is alerted that there are other men out in the water. He sees several survivors, from the merchant ship he sank, on a lifeboat asking for asylum. He orders his men to shoot them as their orders are to not to spare any survivors. His men reluctantly do so. During a rainstorm, the S-33 comes across U-571 and sends its boarding party over. They take the boat by force, losing some sailors in the process. Larson is injured during the fighting later. They capture the Enigma and begin rounding up the prisoners including the captain. The S-33 is torpedoed and sunk by the real resupply sub and the captain is killed. Coonan, Larson, and many others are lost as well so Tyler takes command and orders his men to dive the ship and look for the enemy. They fire a salvo of torpedoes destroying the enemy U-Boat leaving only one torpedo in a malfunctioning tube. 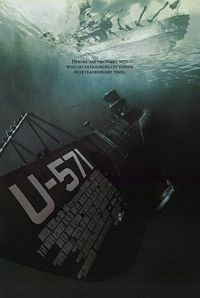 Tyler and his men search for survivors and find two: the black cook from the S-33, Eddy, and a German sailor claiming to be an electrician, but who is actually the captain of U-571. Tyler decides to take the disabled submarine to England. They spot an aircraft, which appears to be coming in for an attack, but is only scouting for a German destroyer. The captured German captain breaks free and shoots two of the crew, killing one, before being subdued. The German ship sends a boarding party to the submarine. Right before the German boarders arrive, the crew of the U-571 fires a shot into the ship's radio tower and dives underneath it. The destroyer begins to drop depth charges to try to sink the U-571. Tyler plans to trick the destroyer into stopping by ejecting debris and the body of the killed sailor out of an empty torpedo tube, then to surface and hit the ship with a rear-fired torpedo. While underwater, the German captain taps out Morse code on the bulkhead of the ship "I am U-571 destroy me" to let the Germans know that the submarine is still functional. The U-571 surfaces, but the rear torpedo tube is still not functional. The destroyer begins firing upon the submarine, which eventually fires its last torpedo. The German ship is destroyed; however, the submarine will not stay afloat for long and the crew abandons ship. Floating aboard an inflatable lifeboat, they are spotted by a US Navy plane.